HURRICANE – Thursday night, Hurricane City Council’s longest discussion concerned the possible approval of a subdivision with collapsible soil. 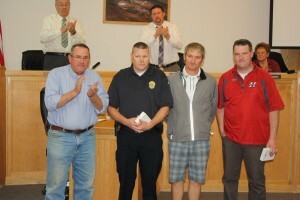 The council also discussed a variance for a beer license, heard a report about the recent Hurricane Mountain Bike Festival and recognized the good deeds of four of its citizens. Representatives from WW Properties came to the meeting seeking approval on a preliminary plat for phases one and two of South Fields Subdivision, located approximately between 1500 and 2400 South and 920 and 1100 West. Councilwoman Pam Humphries opened the discussion stating the biggest sticking point to its development. The proposed subdivision has collapsible soil, much like the soil of the Rainbow Canyon subdivision near the airport in Hurricane. That subdivision, because of its soil conditions, has been a headache for both homeowners and the city since its construction. Local farmer John Wadsworth and his wife, Colette, whose land borders the parcel to be developed, came to the meeting to voice their disapproval. One of the Wadsworths’ worries is that water from one of their fields runs into the proposed development. Drainage on the property is a concern, Colette Wadsworth said, since the 920 West drainage is at capacity. Councilman Darin Thomas said he was reluctant to approve the plat because, as Rainbow Canyon illustrated, a few years after it’s built it could collapse. “If you say no, they’ll sue you, then we’ve bought the property,” City Manager Clark Fawcett said, explaining that the city should approve it with specifications; and despite the warnings, people will build on it. Because of the specifications, he said, there would be more costs associated with it. “We need to make sure we cover ourselves well,” Fawcett said, adding that if the city does everything the engineers recommended, it would be better off. The utilities in the development must be set at a higher bar, Councilman Kevin Tervort said. He didn’t think the city would be sued, he said, and the lots in the proposed subdivision would be one acre or more, which would be better than the first developer’s plan of quarter-acre lots. “We have to allow this developer to have this property,” Tervort said. John Wadsworth said no one should build on it, that it should be removed from development with Rainbow Canyon’s track record as a testament to why. After Wadsworth’s comment, Fawcett said again that if it’s removed from development, the city would have to purchase it. City Planning Director Toni Foran said the city could rezone the rest of the land similar to the parcel to be developed as agricultural. When the original general plan was in place, the land in question was zoned for agriculture, Colette Wadsworth, a former city councilwoman, said. She and her husband were never notified of the zoning change as “property owners next door,” she said. Foran said that, as of 2003, no notice is required to adjacent property owners of zoning changes. Once discussion ended, and Mayor John Bramall asked for a motion on the property, there was dead silence. “No one wants to bite this piece of meat,” Tervort said, chiming in. Pete Farrell of Jackson, Wyoming, came to the meeting seeking a wine and beer license for a property he is purchasing at 60 E. 100 South, the former Adagio Dance Studio next to Over the Edge Sports. He said he’s been coming to Hurricane to mountain bike for five years and has always ended up in St. George or Springdale to eat and have a beer. The recent Hurricane Mountain Bike Festival, with its beer garden, shows that one can have a beer in Hurricane without a problem, he said. Utah law states that an establishment selling liquor cannot be located within 200 feet of a park and the Bradshaw Hotel Museum, considered a park, is across the street, approximately 137 feet away. Hurricane City Planning Director Toni Foran said that the city would have to grant Farrell a variance, local consent, to get around the law. “I don’t look at the museum as a park,” Thomas said, stating he feels the distance requirements are met. “I think you’re far enough away from the community center,” King said. Tervort expressed concern that if the council granted Farrell the variance and the license, other potential business owners in the downtown area would want to do the same. Larson said the council wants to promote more commercial development in the downtown area. At the end of the discussion, Thomas made a motion that the city not recognize the museum as a park and grant the variance for the license. Tervort was the lone dissenter. DJ Morisette, owner of Over the Edge Sports, gave the council a report on the recent Hurricane Mountain Bike Festival, saying that it grew in participation this year by 20 percent, attracting people as far away as Rhode Island and even Israel. Morisette said the number one attraction for people attending the festival, according to surveys, is the quality of the trails. Number two on the list is the social vibe of the festival and third is its demo bikes. Next year they’d like to see more companies participate because this year they were short on demo bikes, she said. The first order of business for the council was recognizing four individuals who turned an 11-year-old boy’s trip to Hurricane for a baseball tournament turn from nearly tragic to extremely memorable. The boy’s baseball gear was stolen from his mother’s car while she stopped at a local convenience store. Four Hurricane residents, Hurricane Police Officer Spence Lundell, Hurricane Wal-Mart Manager Rick Heyrend, Hurricane Recreation Director Bryce King, and Classic Sports owner Jared Elison stepped in to turn things around. They assisted the boy in replacing his equipment, which came from Classic Sports, at no cost. In a grateful letter to the city administration, the boy’s mother, Whitney Fassio, said King told her he didn’t want Hurricane to be remembered in a negative light, but instead to be remembered for the good and kind people who live here.